Das Kartenchaos: Creating Sweet things with shrink plastic! Creating Sweet things with shrink plastic! are you enjoying summer? It's pretty hot over here right now (FINALLY!) and I feel tired but good with all the sun and heat. The colors get darker, more bold and the plastic gets way thicker and more sturdy. Very very cool! I know I'm going to make some meeples out of shrink plastic and with cute stamps. I always wanted to create my own board game. I'll just dab a bit of hot glue onto my Ranger non-stick craft sheet and hold the meeple in it to have it standing. Ha! Should I share a tutorial on that, too? I will also make a cute Keyring for my work-key. (I think it's more than 20 keys... ugh!) but that's pretty close to what I did with the fox. Oh, by the way - this is Foxy from the sweet stamp shop - one of my favorite images ever - so so cute! Have a great sunny week-end! I definitely want a tutorial...what's a meeple?! I'm so intrigued!! Gorgeous earrings!!! You're so incredible!! I forgot to ask: what kind of crayon or marker have you used for coloring? 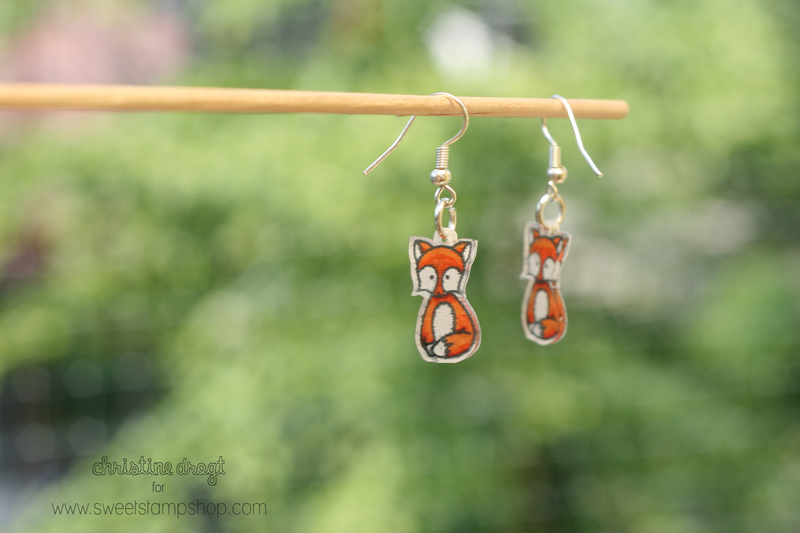 I havn't found the perfect color yet - I want to try something new ;-) The color of your cute fox went great! Args - ich hab's fast schon geahnt! Immer mehr Pfeile zeigen deutlichst in diese Richtung.... mein armes Sparschwein! These are super fun! They would make fun charms for a bracelet or a Christmas ornament too!